Butane lighters are convenient and often economical fire sources that you can purchase at many retail stores. These lighters use butane fuel and often feature an electronic ignition and torch flame useful for lighting pipes and cigars. 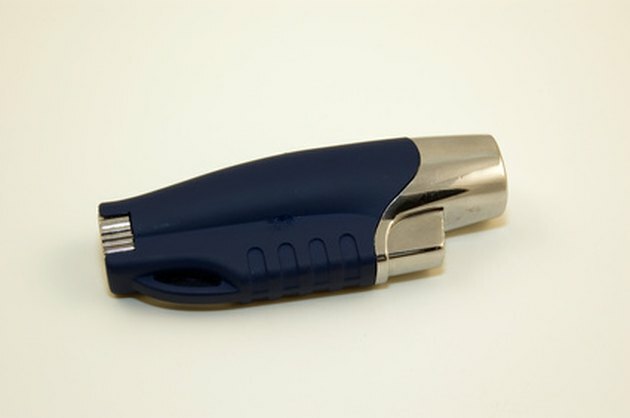 You can easily troubleshoot a butane lighter that will not light. If you follow a few troubleshooting steps, you can often remedy problems that prevent your butane lighter from working properly. Making simple repairs at home can save you a costly manufacturer service repair or even having to replace the lighter with a new one. Press the ignition button or slide the cover, as required, to release butane gas into the burner chamber. Listen for the hiss of the gas as it leaves the lighter. Adjust the flame height control -- commonly located on the bottom of the lighter -- with a blade screwdriver. Turn the flame adjustment toward plus or "+." Try to light the butane lighter. Bleed the tank to remove old butane fuel and any air that may be trapped. Press the fuel-fill valve with the screwdriver blade and hold to release the fuel and air. Place the fill nozzle of a butane fuel can against the lighter's fuel-fill valve. Push the can against the lighter for at least 10 seconds to transfer the butane to the lighter. Clean the lighter's burner chamber with compressed air. Insert the directional nozzle onto a can of compressed air. Hold the tip of the nozzle about 1 inch from the burner chamber. Direct several short blasts of air to remove any carbon deposits or debris.